Read through our Dinosaur birthday party ideas and incorporate the best birthday party ideas into your party. It doesn't have to be difficult to make Dinosaur birthday invitations, here are some easy tips! This Dinosaur birithday party invitations are made by cutting from construction paper a baby T-Rex hatching out of an egg. Two halves of an egg are hinged together with a clasp, so they can be opened to reveal the Dino inside. Copy a dino, volcano, jungle, etc picture from the internet. Print it out on invitation paper and write "Go back to the land of Dinosaurs" or "Welcome to Anna's Jurassic Park" below the image. Write the party information on the back of the invitations. Print the invitations on jungle-design paper, and write "Welcome to Anna's Dinosaurs Birthday Adventure!" and mention some of the exciting activities. Ask all the guests to come dressed as cavemen and women. Either buy a cave outfit for your daughter or make one yourself. 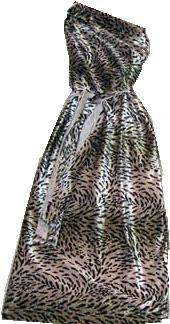 To make one animal print dress you will need a 1-1/2 yard x 45" wide piece of animal print fabric. With the help of a sewing machine start sewing the cave-dress. If you don't have a sewing machine you can easily hand-stitch it with just a needle and thread. Don't forget to make a belt out of the fabric too. We have have lots of Dinosaur birthday party ideas for decorations. Learn how to turn your front yard or your house to a Dino park. The theme colours for this Dinosaur birthday party are green in different shades. So hang lots of green balloons and streamers all over the party area. Decorate your doorways with green streamers hanging from the doorways (jungle concept). Put pictures of Dinosaurs around the party room and place small plastic Dinos around the house. Decorate the gate with jungle-looking fake plants. Put a large sign that reads "JURASSIC PARK". Paint a sign on a piece of old sheet that says "Anna's Dinosaur Park" and hang it on the front fence along with 2 very large cut out cardboard Dino shapes made by using an overhead projector to draw them very large (copy a picture out of a book onto an overhead transparency). Using the overhead transparency method, paint 2-6 other large cardboard Dino using the same technique but shaded in more detail and place them around the yard with wooden sticks. Cut a large T-Rex footprint-shaped hole out of construction paper. Paint it with a paint roller and brown washable paint, and roll Dino footprints up you driveway and down your side path, leading up to the gates of the backyard. Write large paper block letters on the garage instructing everyone to "FOLLOW THE DINO TRACKS", into the house. Use a black tablecloth and green plates and napkins and red cups when serving food and drinks. Or get plates, cups, etc with Dino images on them. Decorate you table with green streamers all over the table. Also, place small plastic Dinos all over the table . For centrepiece have a volcano cake. We have a whole section just dedicated to Dinosaur birthday party games. Below are a few examples of activities and games. But if you want really cool Dino games, then please click away. When the children arrive give them Dinosaur pictures and crayons so they can colour the pictures, until everyone arrives. Provide the children with some Dinosaur tattoos. This is a big hit! 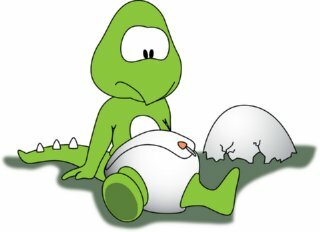 Dino egg hunt, fill about 50 coloured, plastic eggs (easter eggs) full of Dinosaur treats. Each egg has something different inside: Dinosaur stickers, jelly beans, etc. Each child gets a little bag with his/her name on it and then they go around and "find" the eggs you have hidden and put them in their bags. Dinosaur birthday party game similar to Pin the Tail on the Donkey. Beforehand cut out green Dinosaur tails out of green paper. Draw a Dinosaur on a poster board with out a tail and hang it on the wall. Don't forget to blindfold the kids and spin them around at least one time. Dinosaur birthday party game similar to musical chairs, but played with Dinosaur music playing in the background. Lots of fun and kids love piñatas. Fill the Dino piñata with lots of candy and small Dinosaur items. Finish the party off with a Dinosaur story. We have lots of yummy Dinosaur birthday party ideas for food and drinks, have a look below. Pick the suggestions your daughter likes best! Dinosaur Sandwiches: Dino cookie cutters can be used on thin slices of cheese, or to make Dino sandwiches (peanut butter and jelly sandwiches). Dinosaur Cookies: Make Dino cookies with the help of Dino cookie cutters. Dinosaur Chicken: Serve Dino shaped chicken nuggets (available in the frozen food section at Costco). Dino Fruit Salad: Fruit salad with ice cream. Dino Pasta Salad: Pasta salad. Prehistoric Punch: Lemonade with fruit. Juice & Soda: Serve blue, reed and green soda. Our Dinosaur birthday party cake is very easy to make. To make this Dinosaur birthday party cake you need to make two bunt cakes, turn them upside down and freeze them. Before carve them into volcano shapes. Frost the volcano cake with chocolate frosting. Add some red, orange and yellow "lava" frosting coming down the sides, a few plastic dinosaurs and palm trees along the bottom. Fill the party bags with: bubbles, Dino toys, homemade Dinosaur sugar cookies (with frosting and sprinkles). Include the Dino eggs and prizes the kids hade found. To make the actual gift bag buy small green lunch bags and put Dinosaur stickers on them. Children's museum gift stores and most toy stores are good sources for prehistoric paraphernalia. I hope our Dinosaur birthday party ideas has helped you in your planning and I hope your little princess will like her party! If you have great Dinosaur birthday party ideas, SHARE them with us.